In the English city of Bournemouth the right wing party UKIP (UK Independence Party) made a very good result and won the European Election in May 2014 with 26,8%. How strong is this right force at the southern coast in England? Mehrdad Riazati (34) lives and works as a cab-driver in Bournemouth. He speaks Arabic and just a bit of broken English. 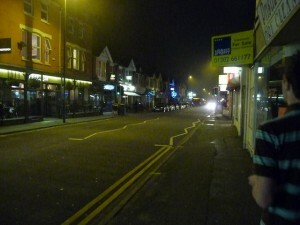 “Welcome to the Gaza Strip”, he says with a smile as he gets out of his taxi and shows a long passage in the middle of Bournemouth – a city with 200.000 inhabitants.